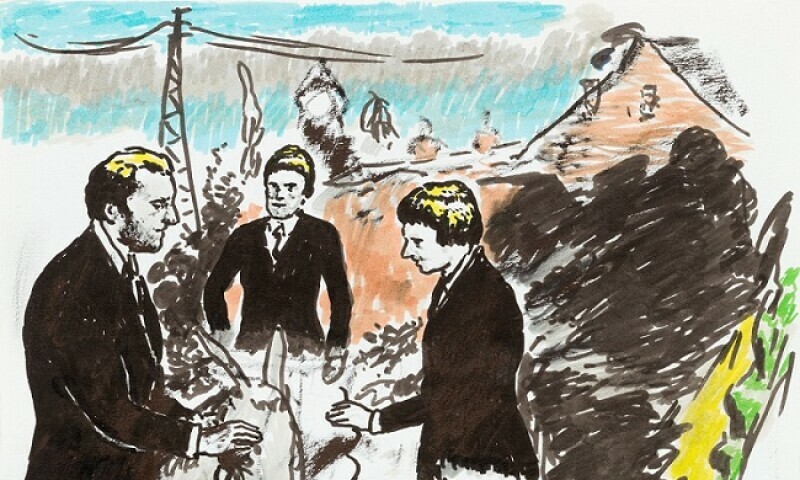 Neo Rauch, Die Eselpfleger, 2013. Felt-tip pen and oil on paper. 8 1/4 x 11 3/4 in. Neo Rauch is one of the best-known artists from the Leipzig school in Germany. His psychologically complex paintings have been widely collected and written about for more than twenty years. Neo Rauch: Aus dem Boden / From the Floor will be the first exhibition of his drawings in the United States. A collaboration between the Des Moines Art Center and The Drawing Center, the show will first open in Des Moines. In spring 2019, the exhibition will travel to The Drawing Center and will be on view for four months. Neo Rauch: Aus dem Boden is co-organized by Jeff Fleming, Director of the Des Moines Art Center and Brett Littman, former Executive Director of The Drawing Center, NY.